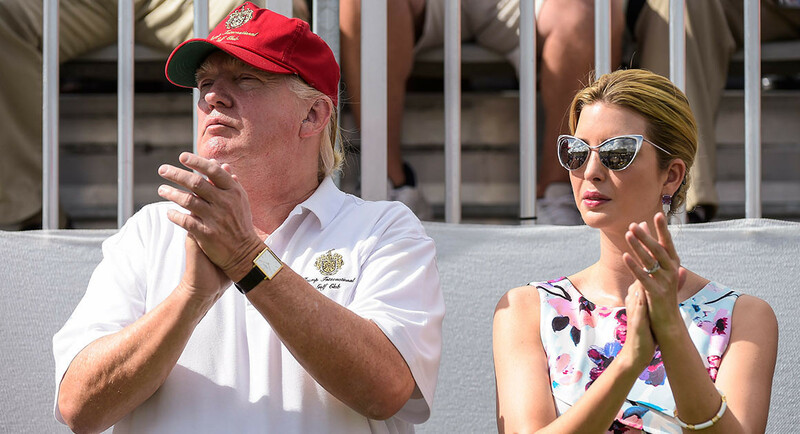 .. Ivanka Trump used personal account for emails about government business ..
Thread: .. Ivanka Trump used personal account for emails about government business ..
Ivanka Trump used a personal email account to discuss or relay official White House business, according to emails released by a nonpartisan watchdog group. Trump's usage of a private email account will bring comparisons to former Secretary of State Hillary Clinton, whose usage of a private email server instead of a government email account during her time in office was a central part of President Donald Trump's campaign against her in 2016. Trump's supporters often chanted -- and still do, on occasion -- "Lock her up!" Will Trump stand-up and tell it like it is, or cover up Ivanka's breaking the law ? , Trump used her personal account to email Cabinet officials, White House aides and assistants. The Presidential Records Act requires all official White House communications and records be preserved. , "The president's family is not above the law, and there are serious questions that Congress should immediately investigate. Did Ivanka Trump turn over all of her emails for preservation as required by law? Was she sending classified information over a private system?" Trump has called Clinton "Crooked Hillary" for using a personal email account when she was secretary of state. Trump will sweep this problem under the table as he does everything concerning him or his family. ​Lock her up, Lock her up !!! Hey Rob,, Happy Thanksgiving !!! They are all criminals! Absolute power corrupts, absolutely. Nothing to see here. Just another criminal in the whitehouse.
. you're so right, all true, for sure,, now we have the 'worst of the worst' , we've never had a narcissistic, callous, authoritarian, meglamaniac, not to mention 'unfeeling pathological liar' as potus , maybe Nixon, but he didn't have the 'balls' trumpski has..
[now we sit back and wait for prince to chime in] ..
N?m ?? ?c s? t? ?ng quan gi?a th?nh ng? ti?ng Anh v? ti?ng Vi?t s? giÃºp quÃ¡ trÃ¬nh h?c ti?ng Anh hi?u qu? h?n; song song, ng??i ? ?c thÃªm hi?u, thÃªm yÃªu s? gi?u ? ?p c?a ti?ng Vi?t. Raining cats and dogs t?c l? â€œm?a nh? trÃºt n? ?câ€�; nh?ng ?i?u ?Ã³ liÃªn t? ?ng gÃ¬ ? ?n mÃ¨o v? chÃ³? Bite the bullet t?c l? â€œng??m ? ?ng nu?t cayâ€�; v? ?y vÃ¬ sao c?n viÃªn ? ?n l?i mang Ã½ ?Ã³? Hanging by a thread t?c th? â€œng?n cÃ¢n treo s?i tÃ³câ€�, v? ?y th? gÃ¬ ?? ?c treo ? ?Ã¢y? Chuy?n k? th?nh ng? Anh - Vi?t mang ? ?n cho ? ?c gi? nh?ng lÃ½ gi?i ham th?ch v? b?t th?n. N?m ?? ?c s? t? ?ng quan gi?a th?nh ng? ti?ng Anh v? ti?ng Vi?t s? giÃºp quÃ¡ trÃ¬nh h?c ti?ng Anh thÃº v? v? hi?u qu? h?n. song song, ng??i ? ?c s? c?ng thÃªm hi?u, thÃªm yÃªu s? gi?u ? ?p c?a ti?ng Vi?t. Trong kho t?ng v?n ch? ?ng dÃ¢n gian Vi?t Nam, ca dao, ph? ?ng ngÃ´n v? th?nh ng? chi?m v? tr? quan y?u. ?Ã¢y l? cÃ¡c th? lo?i hÃ¬nh th?nh t? v?n s?ng th?c ti?n, trong ? ?i s?ng sinh s?n v? quÃ¡ trÃ¬nh ???ng ? ?u c?a qu?n chÃºng. NÃ³ ph?n chi?u kinh nghi?m v? lao ? ?ng sinh s?n, ghi nh? ?n cÃ¡c hi?n t? ?ng l?ch s?? t?ng l?p ho?c di?n t? tri?t lÃ½ s?ng c?a dÃ¢n gian. What was it she sent on her personal email? Anything classified? If classified information wasn't sent it's a complete non-issue. Had classified information been sent on her personal email that would have come out already and had liberals killing each other trying to be the loudest one chanting lock her up. If classified information was indeed sent then she needs to be investigated and, if warranted, prosecuted. That being said, the precedent of using private email, much less a private unsecured server, and not being prosecuted for it has already been established. What are the advantages of a business account?